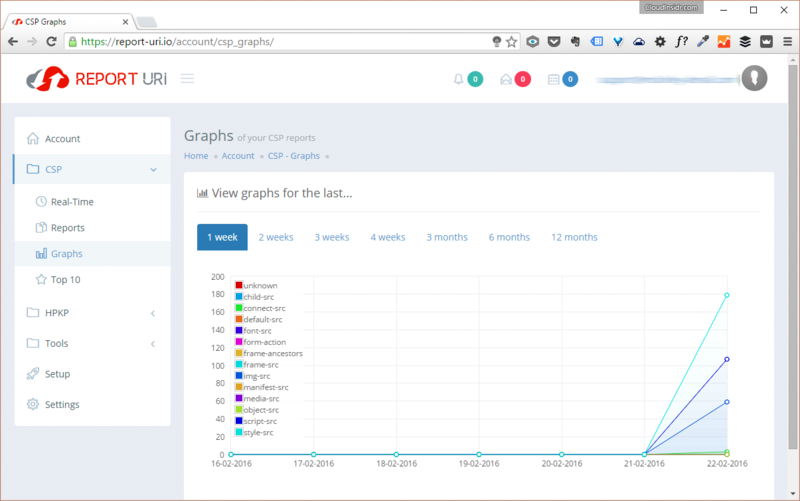 Have you seen malicious activity in your web server logs or in your analytics suite? Don’t panic. By using a Content Security Policy, you can defend your infrastructure against cross-site request scripting and cross-site request forgery. You as the web administrator, along with your web developers, are responsible for ensuring the safety of visitors who trust the code you deploy. A correctly configured Content Security Policy goes a long way towards that end by telling the browser which scripts you explicitly authorize to run on your domain. How do you know if your website has a Content Security Policy in place? One way to quickly verify if security headers are set it is by using the free service https://securityheaders.io/. This service will list any directives you have in place, but it can’t judge if your Content Security Policy headers make sense. You have to make that decision yourself. A CSP cannot defend your web application from inline script injection. With inline script injection, the malicious payload is being served from a trusted domain and so the browser will accept it as legitimate. In order to safeguard your visitors from inline script injection, there are a few important actions you need to take (see steps 3 and 4 below). It goes without saying that you don’t have to wreck your website to figure out the policy settings. Begin in the permissive mode. Configure your policy, keeping an eye on errors in the Console of Developer Tools panel of your browser. Make sure that you have ironed out all the kinks before you begin enforcing your policy. A half-baked configuration may cause not scripts, images and CSS stylesheets to fail to load correctly. Only after all errors are gone you will want to switch to the enforcing mode. To activate the permissive mode, open your web server’s configuration file which defines its behavior for your website in a text editor of your choice. NGINX configuration files are typically located in /etc/nginx/ or its subdirectory sites-enabled. The Content Security Policy [...] was delivered in report-only mode, but does not specify a 'report-uri'; the policy will have no effect. Please either add a 'report-uri' directive, or deliver the policy via the 'Content-Security-Policy' header. Luckily, you can easily fix this nagging and be in compliance without writing a line of code thanks to the service https://report-uri.io/. Here is how to do it in more detail: How to set up Report URI to prevent code injection attacks. The browser should finally quit nagging you about the missing report-uri and the service report-uri.com can begin collecting valuable analytics data relevant to the security of your web applications. You can view the results in the section CSP under the subheadings Reports and Graphs. Right now, your Content Security Policy is empty and not doing anything. It’s time to whitelist approved content sources. Code injection attacks can be prevented by using the directive script-src. This directive whitelists the content sources that you explicitly approve of. Now the real question is: how do you figure out what to approve of? Start by setting up the fallback. You are still working in the permissive mode. Changes will take effect immediately, but merely reflect in the reports; they won’t break your site (unless you break the syntax). In order for a resource to be loaded, you have to specify it with a directive appropriate for its content type. ‘unsafe-eval’ allows the use of mechanisms like eval(). Don’t add a directive twice, as the second instance of a directive will be ignored. Separate additional values of a directive by spaces and end the directive with a semicolon (The semicolon after the closing double quotation mark belongs to NGINX). Now that you have approved your own website, browsers will trust all inline scripts and execute them with reckless abandon. If you don’t have inline scripts, skip to step 4. // Some inline code I can't remove yet, but need to asap. Implementing ‘nonce-…’ is a lot of (rather senseless) work. Unless you are running a site with in an extremely security sensitive context, you may want to use hashes instead. Navigate to your website in a web browser of your choice and open its Developer Tools panel (right-click on the page, select the Inspect command, then switch to the appropriate view, which is usually Network, and turn your attention to the Console). Make sure your web server has reloaded your most recent configuration file, then reload the page. Look at the output in the browser’s Console. Copy the hash value provided by your web browser to your clipboard (including ”) and add it into the script-src directive. Using hashes may not be a good idea for inline styles which you don’t control, however. If your styles are provided by plug-ins, this job would never end and may impede your ability to add content or functionality to the site, because of the sheer amount of work involved in verifying and “approving” inline styles for execution. Use the ‘unsafe-inline’ directive instead of the hashes, and move on. WARNING: The parameter ‘unsafe-inline’ is ignored if either a hash or nonce value is present in the source list for the directive. Inline CSS (cascading stylesheets) pose a similar challenge, but luckily a far lesser risk—approve them as described in step 4, and move on. Now all inline CSS originating from your server will be executed. Next, you need to trust scripts provided by your analytics services, your advertisers, and the like (if you don’t feel like trusting external content sources, what’s the point of loading these files?). Navigate to your website in a web browser of your choice and open its Developer Tools panel (right-click on the page, select the Inspect command, then switch to the appropriate view, which is usually Network, and turn your attention to the Console). Make sure your web server has reloaded your most recent configuration file, then reload the page. Look at the output in the browser’s Console. Now comes the heavy lifting: manually evaluating content sources and adding them to the policy is no fun. Solution: add ‘unsafe-eval’ to the Content Security Policy directive script-src. 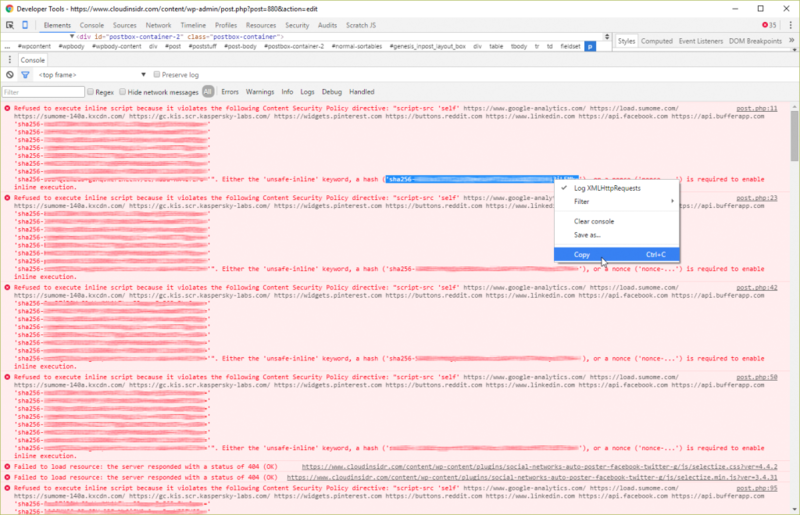 [Report Only] Refused to execute inline script [...] Either the 'unsafe-inline' keyword, a hash ('sha256-17oBQkrpUDBidsaV61+43f1oWjeWxyMuKwnugVDQFQg='), or a nonce ('nonce-...') is required to enable inline execution. That only means you have overlooked an inline script in Step 3 above. WARNING: It bears repeating that the parameter ‘unsafe-inline’ will be ignored if either a hash or nonce value is present in the source list for the directive. Once all errors are fixed, switch to the enforcing mode. Below is an example policy. (Please remember: this is a one-liner; you must remove all end-of-line characters before restarting NGINX). Also, visit your analytics dashboard to investigate policy violations. One last thing: make sure you back up your web server’s configuration file.